30 April - Ceredigion Local History Forum "Transport in Ceredigion" at Llwyncelyn Hall, SA46 0HF. 10.30am-4pm. The day will include expert speakers talking about the many different forms of transport used in the county, including Car & motorcycle registrations, Shipping & Crew Agreements, Railways and The history of roads in Ceredigion. 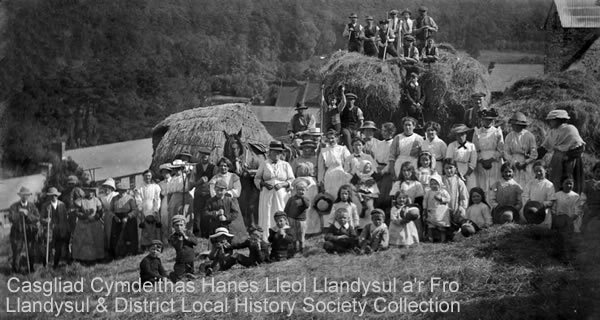 14 May, 10am-4pm - Family and Local History Fair at the National Library of Wales, Aberystwyth. held in collaboration with the Cardiganshire Family History Society and the Association of Family History Societies of Wales. Free admission. Llandysul and District Local History Society will have a stall there too. Our meeting on Wednesday, 25 May will be a visit to the Internal Fire Museum of Power at Castell Pridd, Tanygroes, SA43 2JS. The museum is on the A487 Cardigan to Aberystwyth road, 8 miles north of Cardigan just before the village of Tanygroes (signposted from the road). We will meet in the Museum car park for a tour starting at 6 pm, when they will start several engines for our tour. The cost is £6 per person (£5 concessions) and tea and coffee will be available (at extra cost). Members, non-members, friends and relatives are all welcome as we need a minimum of 20. Please join us on this visit - you will be amazed!! Gerynant, Talgarreg. SA44 4ES. Wednesday, 24 August. Meet at museum at 6 pm. Just over 100 years ago in 1916, the film "Battle of the Somme" was shown at the Porth Assembly Hall. We will be showing the film again on Wednesday 30th November, 7pm, at the Porth Hotel, Llandysul.